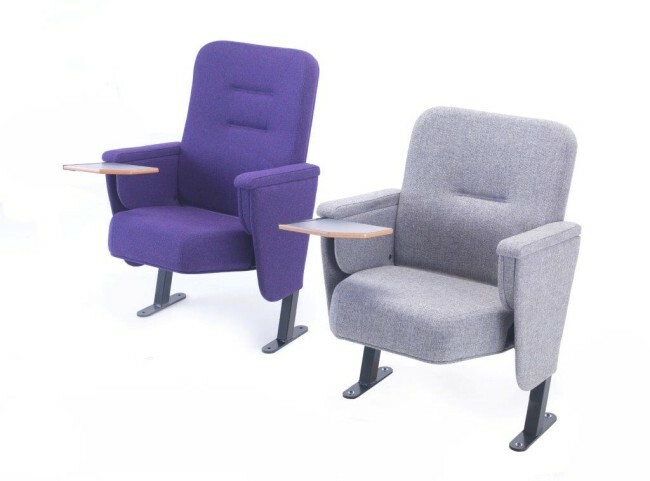 The Aspire Conference range offers two styles of chair suitable for use in conference facilities, training rooms and other corporate venues. Both chairs are available fully upholstered or with polished wood seat and back outers, with the option of a foldaway writing tablet. Aspire Conference chairs portray a smart, professional image and with a wide range of fabrics and colours to choose from you can select a cover material to match or complement your corporate colours. Writing tablets are available in various finishes. The chairs have been designed to provide quality, comfort and style whilst being robust and hard-wearing. All Evertaut seating can be tailored to your exact requirements and to fit your unique space. Removable banks of seating can be installed to allow accommodation of wheelchairs. Aspire Conference: A classic style conference chair with fold-away, anti-panic writing tablet. Aspire Conference Deluxe: The Deluxe model includes enhanced back support and increased back depth for improved comfort and stability. Design detailing within the seat back offers improved aesthetics and enhances the overall look of the seating.